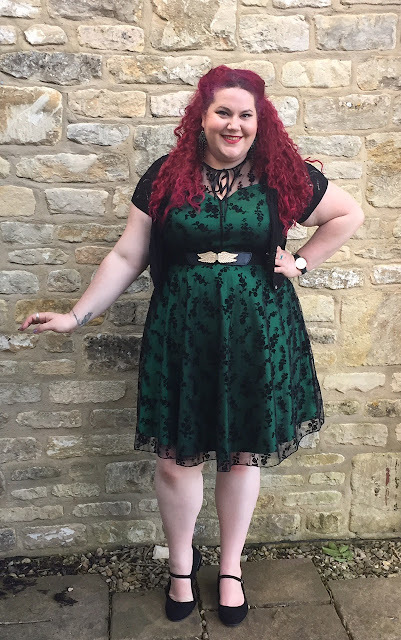 I first fell in love with this Voodoo Vixen dress over 18 months ago, on my very first trip to their website. But I have total dress attention deficit disorder. Somehow it slipped of my radar, and then I just got distracted by something else pretty and shiny. 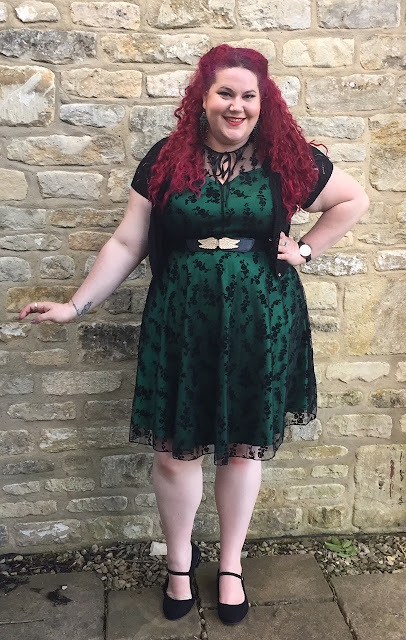 However, Voodoo Vixen had a stand at Curvy Con and I saw this little Emerald beauty again and just had to have it! 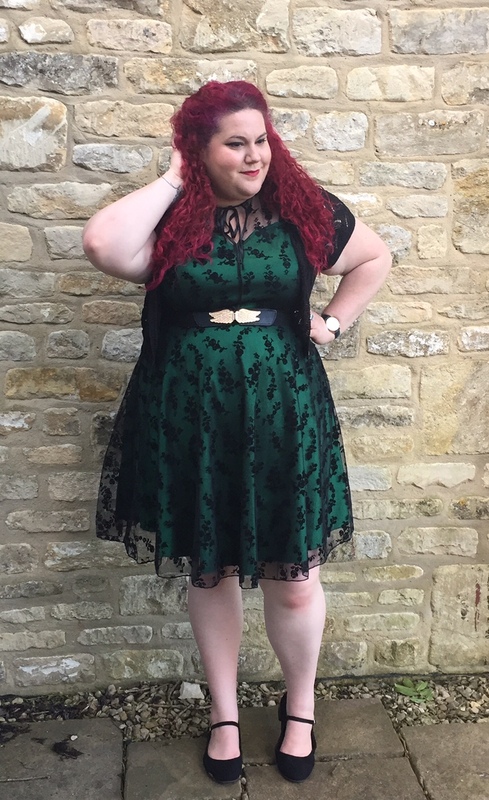 The Emerald Green Penny dress is definitely fit for special occasions. 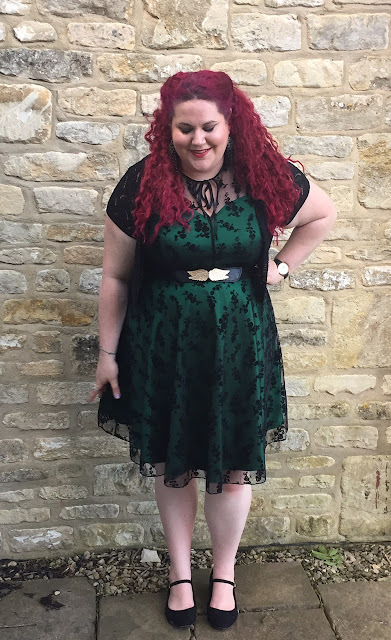 The underlayer is an emerald taffeta (the photos don't capture the jewel like tone sadly), cut with a heart shaped neckline and coming to just above the knee. Penny has an overlay of black net which is embossed with velvety flowers. The style is sleeveless, and has a round neck with a tie at the throat. It nips in at the waist in a prom style, and really is perfect for evening occasions. I bought it in a 3XL - which according to Voodoo Vixen is a 24. I find their cuts are often on the small side so this was a comfortable fit. I have some pieces from Voodoo Vixen in a 2XL so I think it really depends on the fabric and the cut. 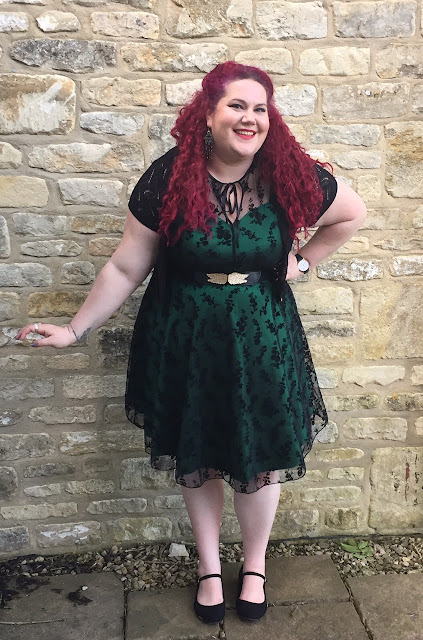 While I was recently away in the Cotswolds for a bachelorette weekend, we had one evening where we dressed up for dinner and shenanigans after. I decided to wear my new Penny dress and it was perfect. It looks so glam and yet is really comfortable and easy to wear and due to the skater style cut it requires no shapewear. Yay! I added a medium width elasticated belt with a gold clasp (a couple of years old, from Primark), a cropped cardi because in the evening it was a little chilly, and some flat black Mary Janes and I was good to go. If I was dressing up to properly go out I would probably add heels, do my hair up and add some sparkly earrings but this felt like the right look for this occasion. 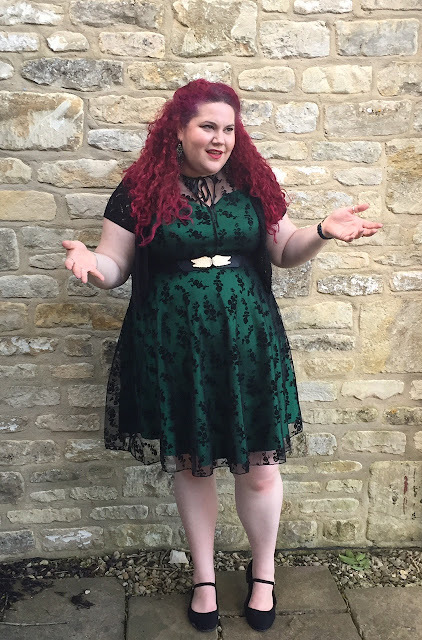 Honestly, there's not much more to say than that this dress is really lovely, easy to wear and a beautiful statement on a night out, and that you should really just go with your initial instincts and if you like something that much buy it! Looking forward to wearing this beauty again! I'm so glad I pressured you into buying this dress lol You look incredible! This dress was one hundred percent made for you and your bangin bod. Your're such a good/bad influence. I think I am going to have to do an entire blog post of out takes one day. Ridiculous! Lol! 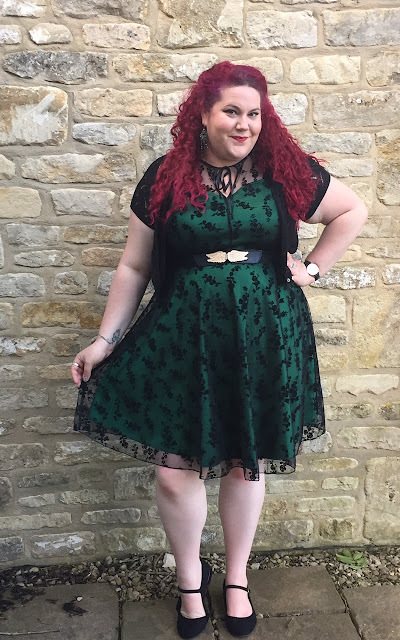 You look amazing - love this colour on you so much you absolute vixen! You look fabulous in that dress! I am considering buying it for a gala ism going to this Fall. I'm trying to figure out if I am better to get the 2XL or 3XL as my measurements are kinda better the both. Would you mind sharing your measurements?